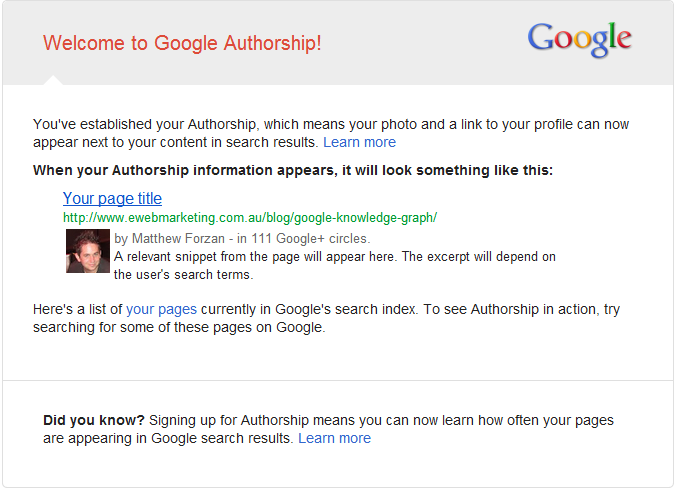 Last night I received an email from the “Google Authorship Program” with a subject line of “Welcome to Google Authorship!”. 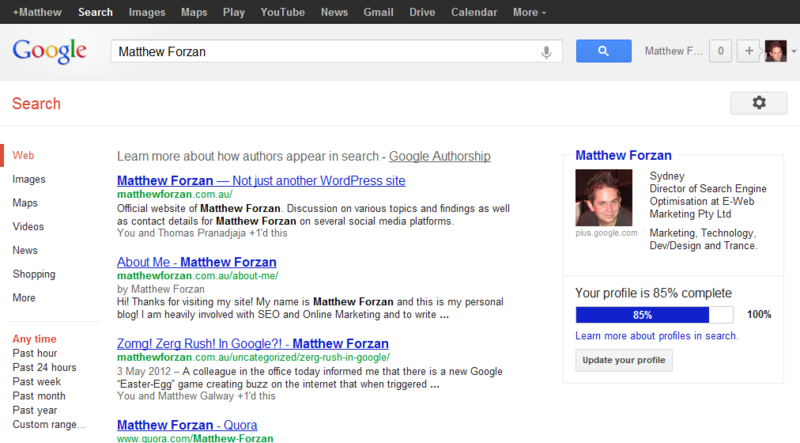 The email went on to tell me that I’ve established “Authorship” and should expect to see my photo next to search results. Cool huh? These are all the articles Google knows I’ve written! Similar to LinkedIn, Google now shows you a “profile completeness” indicator, but doesn’t specifically tell you what you need to do to achieve 100% completness as yet. Filling out my education section gave me 100%. Authorship is here to stay – and it’s really important to get involved. If you’ve heard of AuthorRank before than you’ll know why. If not, here’s a quick backstory. In 2005, Google filed for a patent for something called “Agent Rank”. The patent references ranking “agents” (i.e. people) and looks at the content they’ve created and their interactions with others online as a ranking factor. At the time, there wasn’t a system or technology in existence that could execute Agent Rank so it remained stagnant for years. Fast forward to 2011 and Google again expressed the need to identify “agents” to improve search quality in an effort to remove more spam. Now in 2012, you can link your Google+ account to articles you’ve written, in theory allowing Google to finally execute their “Agent Rank” or “AuthorRank” as its come to be known, which could rank web pages based on the credibility of their authors. While isn’t a current ranking factor, there are many positive signs that it will be soon: the push to adopt Google+, Google Authorship and the latest round of notification emails, and the Big G’s ongoing effort to measure quality through algorithm updates like Panda and Penguin. Start writing quality content on a frequent basis! Thats awesome! Where can I learn more?